Portland has many nicknames. Two nicknames are “Bridge City” and “Bridgetown”. That is because 12 bridges cross the Willamette River in Portland. 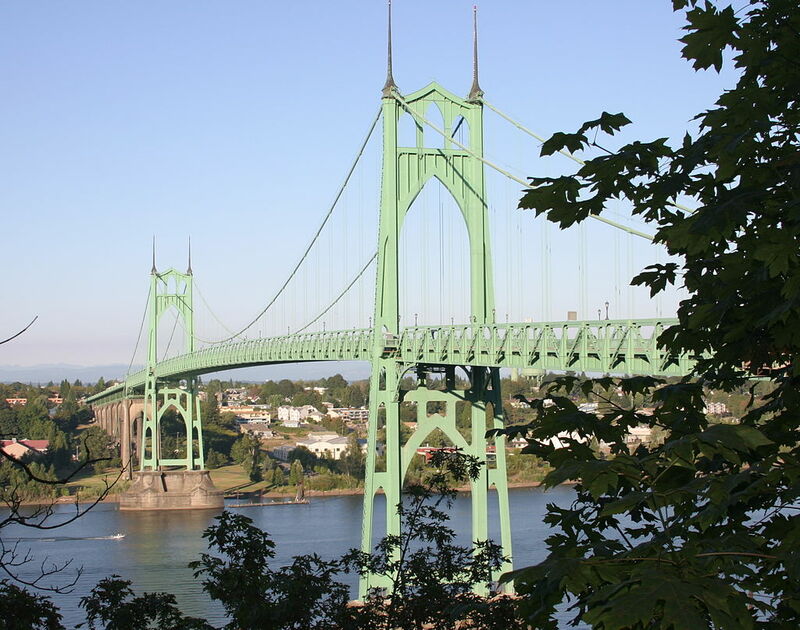 The St. Johns Bridge connects North Portland and Northwest Portland. It is a suspension bridge. It is the tallest bridge in Portland. The next bridge is the Burlington Northern Railroad Bridge. Only trains use this bridge. About 30-35 trains cross the bridge every day. The Fremont Bridge is part of Interstate 405. It is the longest bridge in Oregon. It has two levels. Each level is called a deck. Cars on the upper deck go west; cars on the lower deck go east. The Broadway Bridge is very old. It was built in 1913. Cars and trucks use this bridge. The Portland Streetcar uses this bridge, too. It connects the Lloyd District with downtown Portland. The Steel Bridge opened in 1912. It has two decks. Both decks can move up and down for boats underneath. The lower deck is for bicycles, people, and long trains. The upper deck is for cars and short MAX trains. The Burnside Bridge opened in 1926. It is made of concrete. That means it is very heavy. It opens for boats about 35 times a month. There is a skateboard park under the east side, and the Portland Saturday Market is under the west side. The next bridge is the Morrison Bridge. It is a very busy bridge. It was built in 1958, but there were other bridges here before this one. There are special lights at night with different colors and patterns. 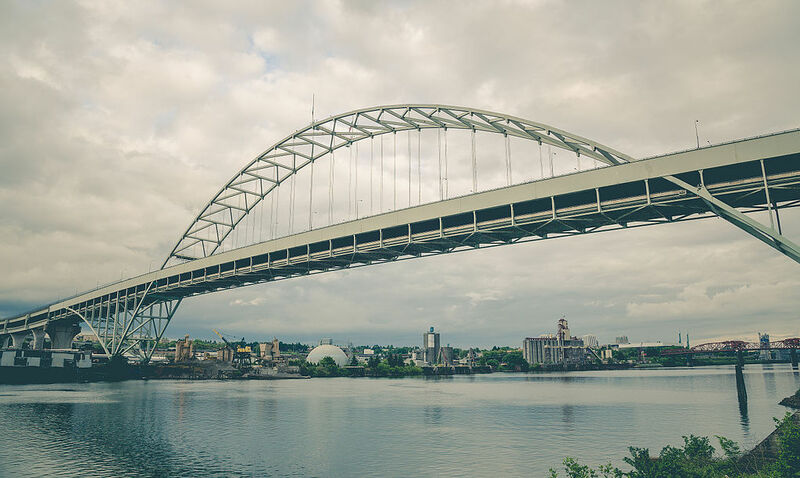 The Hawthorne Bridge is the oldest highway bridge in Portland. It was built in 1910. Every day 8,000 people ride bicycles across this bridge. 800 buses use this bridge, too, with 17,400 people. The Marquam Bridge is part of Interstate 5. It is the busiest bridge in the state. More than 140,000 vehicles cross the bridge every day. It has two decks. Many people do not like this bridge. They think it is not very pretty. Tilikum Crossing opened in 2015. “Tilikum” comes from the Native American word for “people”. So it is sometimes called the “Bridge of the People.” That’s because no cars or trucks can use this bridge. It is for people who walk or ride a bike. The busses, the Portland Streetcar, and the MAX Orange Line also use this bridge. The Ross Island Bridge opened in 1926. It is also Highway 26. The name “Ross Island Bridge” comes from an island in the river. This bridge does not open for boats. Sellwood Bridge is the last bridge in Portland. It was built in 1925, but the government replaced that bridge in 2016. Engineers made the bridge safer in an earthquake. Why do people use these nicknames? Do you have a nickname? What is it? Why do people call you by that name? 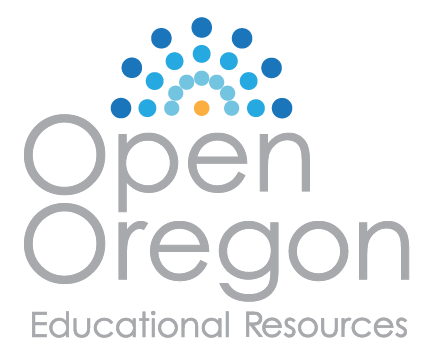 Portland People and Places by Timothy Krause is licensed under a Creative Commons Attribution 4.0 International License, except where otherwise noted.